Habit: Shrub, erect to mounded; generally dioecious. Leaf: simple, opposite or clustered, generally deciduous, short-petioled. Inflorescence: axillary clusters; staminate flowers +- sessile; pistillate flowers pedicelled. Flower: unisexual [bisexual]; calyx minute, lobes awl-shaped, early-deciduous; corolla 0. Staminate Flower: stamens (1)4(6); filaments long, free (in California); anthers white [black]; pistil vestigial if present. Pistillate Flower: stamens 0 or 1--4, reduced, sterile (in California); ovules 2 per chamber; style short, slender; stigma head-shaped or 2-lobed. Fruit: drupe. Habit: Shrub, 12--50 dm, generally rounded. Stem: many, bark smooth, tan-gray; twigs short, +- rigidly thorny, glabrous to puberulent. Leaf: blade 15--40(50) mm, elliptic or lanceolate to ovate, leathery, entire to minutely toothed, glabrous. Inflorescence: generally appearing before leaves. Staminate Flower: 1--5 per bud; pedicel +- 0; filaments 3--5 mm, yellow. 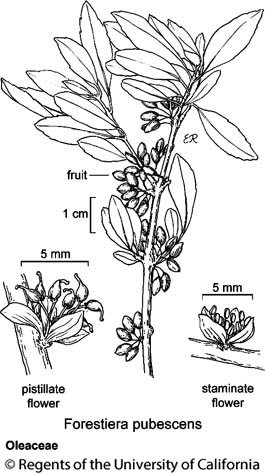 Pistillate Flower: 1--8 per bud; pedicel 2--5 mm, green, some branched; ovary > 1 mm, style +- 1 mm. Fruit: 5--8 mm, elliptic in outline, +- glaucous, purple-black. Chromosomes: 2n=46. Ecology: Streambanks, canyons, washes; Elevation: 100--1800 m. Bioregional Distribution: se NCoRI, s SNF, c&s SNH (e slope), Teh, e SnFrB, SCoR, TR, PR, s SNE, DMoj; Distribution Outside California: to Colorado, Texas, northern Mexico. Flowering Time: Mar--Apr Note: California specimens with glabrous stems, leaves, pedicels, except some in eastern San Bernardino Co.
Citation for this treatment: Family description, key to genera by Thomas J. Rosatti; treatment of genera by James Henrickson 2012, Forestiera pubescens, in Jepson Flora Project (eds.) Jepson eFlora, http://ucjeps.berkeley.edu/eflora/eflora_display.php?tid=25982, accessed on April 19, 2019.
se NCoRI, s SNF, c&s SNH (e slope), Teh, e SnFrB, SCoR, TR, PR, s SNE, DMoj; Markers link to CCH specimen records. Yellow markers indicate records that may provide evidence for eFlora range revision or may have georeferencing or identification issues. Purple markers indicate specimens collected from a garden, greenhouse, or other non-wild location.